Storage: Stored plant life may be safer inside than outside, but it still needs to be checked for signs of decay. Throw away spotted fruits, vegetables, and bulbs. If rot is becoming a big problem, a solution is to buy slotted trays and bins, which allow for better air circulation. Bulbs: While you’re at it, take any remaining, healthy bulbs out of storage. The ground may have frozen before you were able to plant every bulb, but it’s not too late to include more in this year’s garden as long as you act now. Plant bulbs in peat pots, which can then be placed in flats. Put the flats outside in the cold then cover them with layers of leaves. When it gets warm enough, the bulbs will be ready to be planted in your garden. Houseplant maintenance: Continue to monitor the health of your houseplants. Prevent dust from accumulating on plant leaves by washing them periodically. The days are short now; resituate plants if they aren’t receiving enough sunlight. On particularly cold nights, move containers away from windows. For extra insulation, cover glass with layers of newspaper and cardboard. Houseplant hydration: To help them survive the dry indoors climate, mist plants once in a while and surround them with moist pebbles. Houseplants prefer tap water that has been warmed to room temperature. If some of your houseplants aren’t responding well to watering, they may be reacting badly to the fluoride and chlorine often present in tap water. These gases will escape naturally if you let water containers stand overnight before hydrating plants. 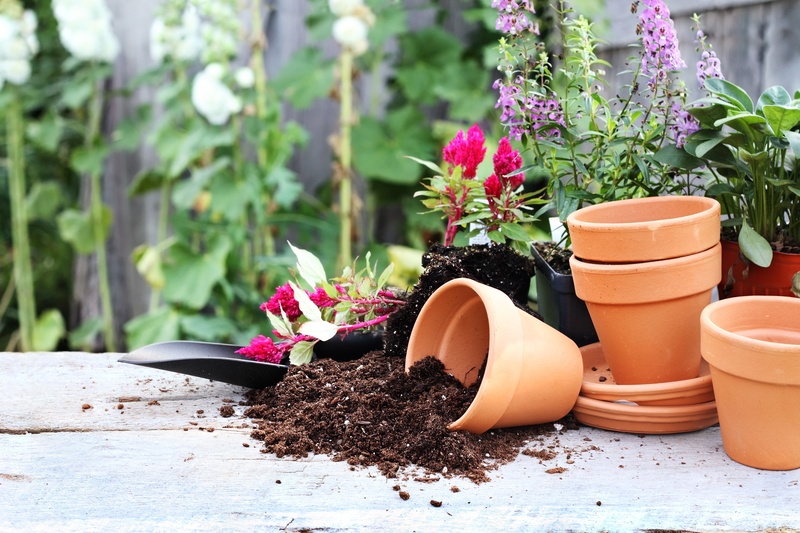 Clean containers: Having trouble cleaning clay pots? Combine one gallon of water with one cup of white vinegar. Let heavily encrusted pots soak in this solution overnight. By morning, dirt and other material should be loosened enough for removal with a steel wool pad. The final step is a good rinsing with clear water, unless you want to sanitize the containers by soaking them in another solution. This time, add one cup of bleach to one gallon of water for sanitization. Soil: January is a good month to get your soil in shape in preparation for planting season. Turn the soil whenever it thaws. This chore doesn’t just break up frozen layers; it dredges up insect eggs and larvae, which will hopefully become bird food. If the soil refreezes, that will kill exposed pests too, so win-win! Snow and ice: Snow shoveled and blown around the yard can actually be relocated to perennial beds. A blanket of snow acts as frozen mulch, protecting plants from harsh conditions. If you’re having trouble walking outside due to slick ice, create traction instead of relying on salt and ice melters, which are hazardous to plants. Scatter sand, bird seed, sawdust or vermiculite snowy pathways. Mulch: There’s also actual mulch to think about. Strong winds and precipitation can cause mulch to shift, so make sure it’s in the right spot and reapply as necessary. Check perennials for plants that may have popped out of the ground due to frost heaving. If this happens, rebury them and cover the mound with more mulch. Limbs: Assess any additional chaos caused by winter weather. For instance, branches harmed by the elements should be carefully removed. Allowing broken limbs to stay intact encourages bark tearing. Seeds: It’s a new year, which means the new planting season will be here before you know it! The seed selection is best earlier in the winter so don’t wait too long to order what you want. Take a look at any gardening notes you may have recorded this year to determine what you’d like to plant this time. For the best results, pay particular attention to varieties resistant to pests, diseases, and drought. Start seeds: Spring may still be a couple months away, but slow-growing plants can be started now. Save time later by planting parsley, thyme, tarragon, bedding geraniums, and sage indoors. Chives, onions, and leeks are hearty enough to live outside before the last winter frost. Since they’ll be ready to go relatively soon, start their seeds as well. Garden layout: Study your current garden layout by referring to diagrams or your own memory. You may want to make changes this year to increase efficiency and productivity. For example, mowing and maintenance may be easier this season if plants are grouped differently. Streamlining, like reducing the size of your garden, may actually mean less work and more growth. Take some time to do research and weigh all of your options before you need to commit.